New Prospects for a Peace Process in Afghanistan? In order for this appeal to be meaningful, however, Ghani will have to address a legacy of failed negotiations under former President Hamid Karzai; deal with the consequences of a reduced international military presence; and manage his own divided government. Despite a stated desire for peace, the obstacles may be greater than the opportunities. There have been three reasons why previous peace overtures have failed. First, President Karzai, despite his pro-peace rhetoric, was uninterested in reaching a comprehensive deal with the Taliban. Instead, he preferred to try to co-opt individual Taliban figures, understanding that a comprehensive political deal would have inevitably reduced his own power. Second, the mistrust that existed between the United States and Karzai during Karzai’s second term meant that they were unable to cooperate on an approach to the Taliban. The lack of trust between two key interlocutors made it difficult for the Taliban to have confidence in a negotiation process. Third, the Taliban themselves were divided. A hard-line faction within the movement believed the planned withdrawal of international troops from Afghanistan allowed for a possible military victory over a weak and unprotected Kabul regime. The Taliban also remains under the influence of Pakistan, which has allowed the Taliban to operate from its territory for the past decade. Pakistani cooperation on achieving peace in Afghanistan was undoubtedly a major topic during President Ghani’s recent visit to Pakistan. There are indications that Pakistan might seek a more cooperative relationship with the Afghan government than it had during President Karzai’s administration. It has, for example, offered to train Afghan security forces. How the Ghani administration reacts to such offers is likely to be crucial in forging a more cooperative and trusting relationship between the two countries. Even so, while Pakistan may encourage the Taliban to engage in a negotiation process, it is unlikely to totally dismantle the support structure for the Taliban within Afghanistan. Pakistan does not have complete control over the Taliban either. The Obama administration’s decision to withdraw all military forces by the end of 2016 will bolster the case of Taliban hardliners to fight rather than negotiate. They will surely argue for a policy of testing the Afghan national security forces next year before entering into genuine negotiations. Ghani’s peace rhetoric is based on protecting the rights enshrined in the current constitution, while accepting that the constitution allows space for the contestation of various political ideas. 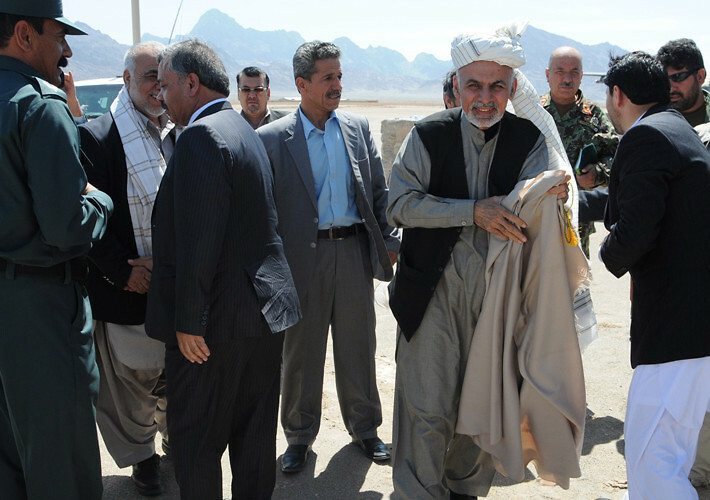 His campaign manifesto stated: “accepting the government is the prerequisite condition for achieving peace.” His intention is that the insurgents should join the existing political system and compete for power in the hopes that political participation will “turn their destructive and negative power into something useful.” It is likely that, should the Taliban indicate a clear willingness to engage in negotiations, Ghani’s approach may shift in response to whatever political demands the insurgents might articulate. Those close to Ghani say that he has thought deeply about this issue and is committed to achieving success. But for now—in the absence of a clear response from the Taliban—Ghani’s government-centric approach explains why his immediate focus has been on attempting to reform and strengthen his own government. This will make it a more effective negotiating partner with a stronger hand, but also a more convincing partner to the Taliban, who will understandably want assurances that the government can implement the terms of whatever deal might be reached. A negotiation, therefore, might not be the immediate priority of the new government. A great deal of confidence needs to be built, and clarity of positions needs to be established. This will still take time. In the short term, between a Taliban potentially emboldened by the withdrawal of international troops, and an increasingly exposed government in Kabul that does not seem inclined to make many concessions, the prospects for a negotiated peace seem slim. The next year is more likely to see the government and the Taliban sizing each other up, seeking the upper-hand in a future negotiation, rather than the beginning of a negotiation itself.